On a day that began like any other, William Rule saved Scotland’s beloved King Robert Bruce from death by wrestling a charging bull to the ground in the Caledon woods on the borderlands of Scotland and England. As a reward for his feat, William was given lands in Bedrule and dubbed Sir TURN-E-BULL (Turnbull). Centuries of persecution drove countless members of the Turnbull Clan out of their beloved homeland and forced many more to change their names in an often-futile effort to escape execution. The Turnbulls became Trimbles, Trumbulls, Turnballs, and Trumbles. The names may have changed, but the legacy has remained as strong as the man who turned the bull. 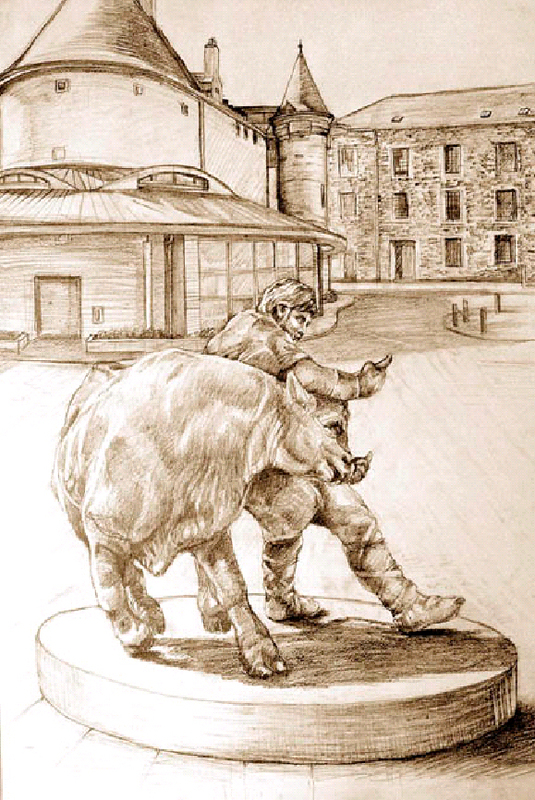 That legacy is now going to be preserved not only in the mouths of storytellers, but also through the Turning of the Bull monument, which will find a home at the newly constructed Hawick Heritage Hub. 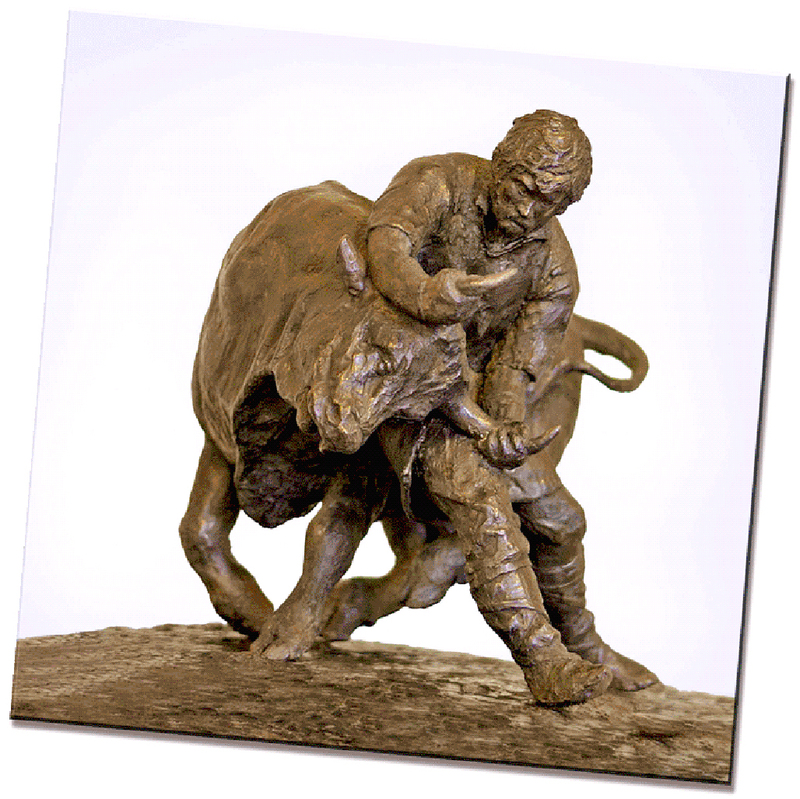 The monument depicts William Rule in the throws of turning the bull, the fateful moment in 1313 that changed Scottish history. For, if the bull had prevailed and killed Robert Bruce, there there may not have been the Battle of Bannockburn in 1314, the Declaration or Arbroath in 1320, or the treaty of Northampton in 1328. The Turning of the Bull monument and the Hawick Heritage Hub are part of the nationally recognized Heart of Hawick Project, designed to bring thousands of international visitors and genealogy pilgrims to the borderlands in Scotland. At present, the Turnbull Clan Association is raising funds to fulfill its sponsorship of the monument. 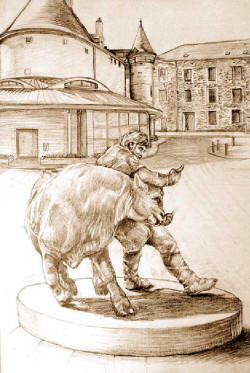 Nationally acclaimed artist Angela Hunter has already begun work on the preliminary stages of the Turning of the Bull monument, which is expected to be unveiled at the 2009 Hawick Reivers Festival.